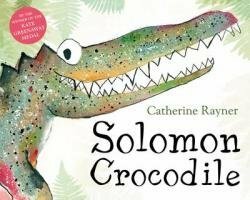 Small children love to tease and enjoy getting a response even when it is negative and Solomon the playful crocodile is no exception. He wants to have fun, but only by tantalizing those who refuse to play with him. When his bugging of the dragonflies and stalking of the storks gets him nowhere, naughty Solomon charges at the biggest creature, the hippo. But the hippo’s open mouth almost engulfs the mischievous crocodile, and Solomon is forced to retreat until he hears a noise… This is a picture book with great page turning drama and suspense and with a surprising ending sure to make toddlers chortle with glee, especially when naughtiness wins out. The language is fresh and poetic and the deftly handled watercolour illustrations satisfyingly combine colour, pattern and texture.